If there is one thing aside from cooler temperatures that screams fall, it’s finding and making an amazing homemade apple pie recipe. Actually, it’s all apple recipes period, but there is simply something about a warm piece of apple pie topped with a scoop of vanilla ice cream that makes me feel like the heat of summer is truly gone and Christmas is right around the corner. It’s that specific time of the year that this homemade apple pie recipe runs into the room screaming “I’m delicious!” along side of its own homemade pie crust recipe to make your kitchen smell amazing and your tummy very, very happy. It’s almost as good as my peanut butter meringue pie recipe although that one will always be my favorite! 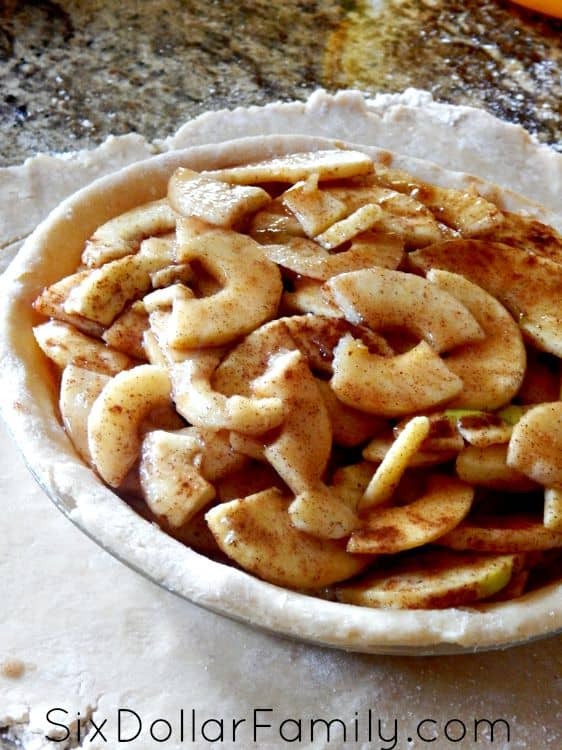 Finding a good apple pie recipe can be hard and finding a homemade pie crust recipe can be even harder. I remember the first time I made traditional apple pie; the recipe was so complicated I ended up tossing everything and finding a different recipe. You won’t have that issue with this apple pie recipe though. 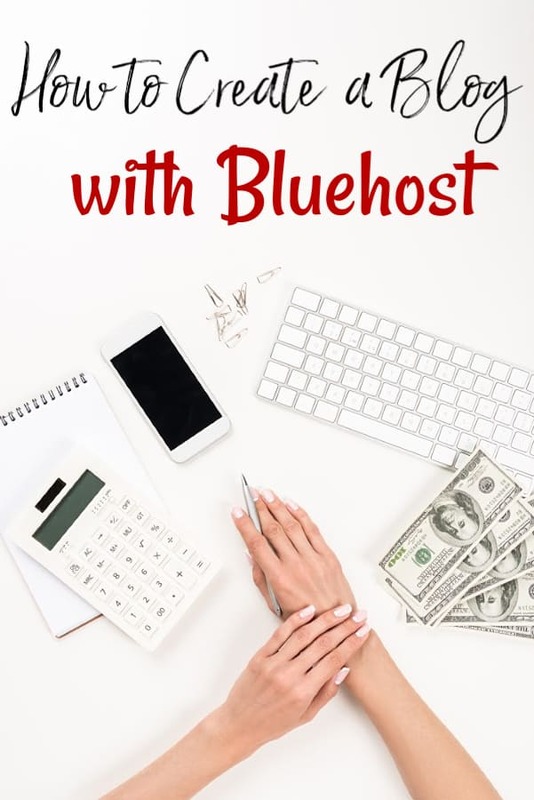 It is so simple my girls can do it! Over the years, it has become a staple Thanksgiving treat for my table and once you try it, I’m sure it will for your family too! It’s also perfect for summer picnics! 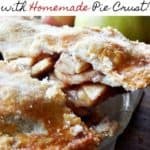 When we have one to head out to, I always take this apple pie recipe along side of my cherry Kool-aid pie recipe and they’re both a big hit! When you make this apple pie recipe, you can do so with any apples you have on hand, however, we like to use Jazz apples for our reds. If you can’t find Jazz apples, opt for a Gala or Johnathon apple instead. 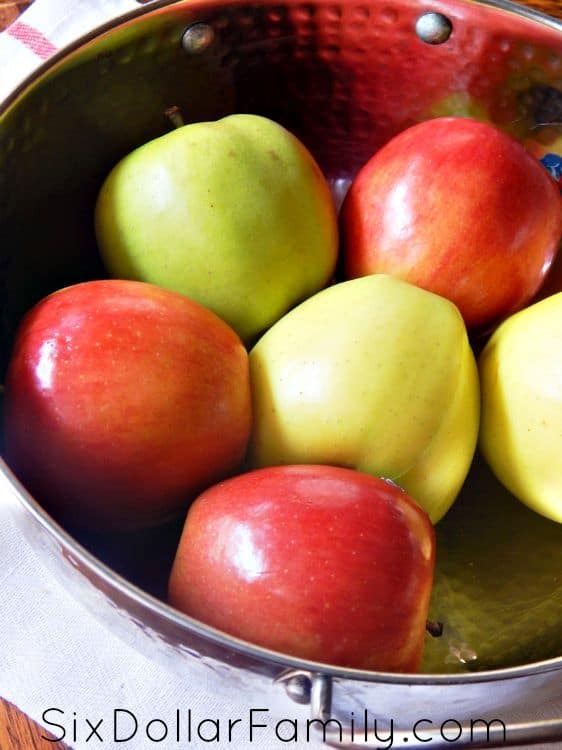 For your yellow, Granny Smith apples will give you the best taste and consistency. It is, however, your apple pie recipe so feel free to use any that you have on hand if you don’t want to search for specific kinds. Just be aware it may change the taste or consistency of your apple pie filling. When you make the homemade pie crust recipe that I use for my homemade apple pie, make certain the butter is cold and that you’re using real butter. What I like to do is cut my butter into cubes and freeze them for a few minutes so they’re super cold. Doing it this way means I don’t have to worry too much about them thawing before I have the chance to cut them into the homemade pie crust recipe. To begin making this homemade apple pie recipe, preheat the oven to 375°F. Then, use an apple peeler to core and peel all the apples. Don’t throw the core and peels away! There are quite a few uses for apple peels that can help you make other yummy things, clean your house or even get healthier! 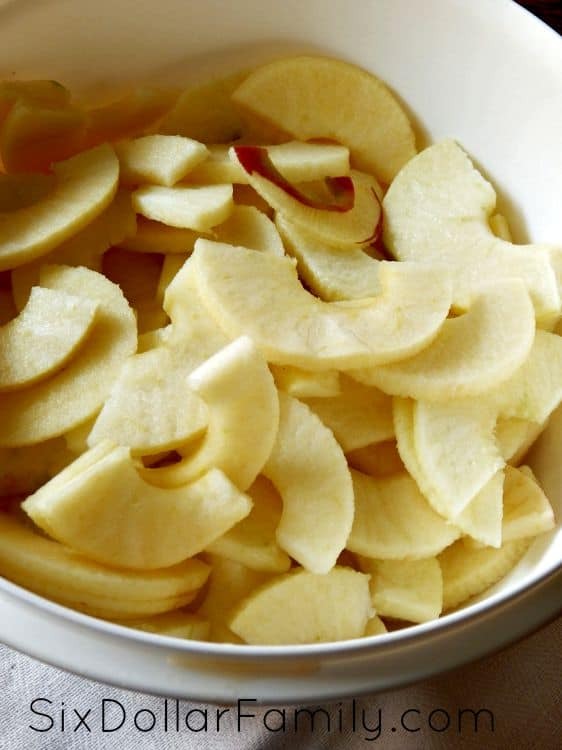 Once you have peeled and cored the apples, slice them into slices of medium thickness then add them to a large mixing bowl. Gently toss them with both sugars, the cinnamon, flour and nutmeg making sure you get a good coating on each piece. I find a rubber spatula works best for this step. Set them aside once they’re coated well. Next it’s time to make the homemade pie crust recipe. Combine the flour with 2 tablespoons of white granulated sugar in a medium mixing bowl. Give it a couple of stirs to combine it well and then cut the butter cubes into the flour mixture using a pastry blender like THIS one. If you’ve never cut butter into flour before, you’re looking for a consistency that resembles corn meal. 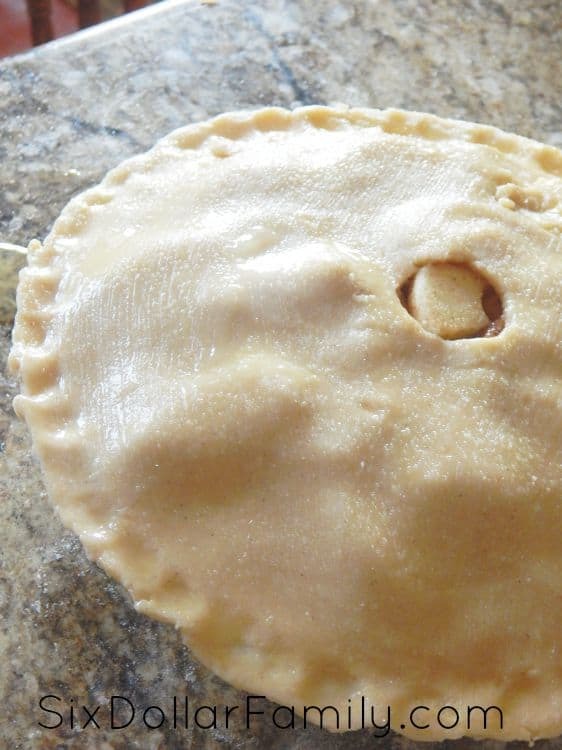 You’re ready to move onto the next step in the pie crust recipe when the butter is pea sized and it holds together when you grab a handful and squeeze. This is why your butter needs to be very cold. If it isn’t, it will simply mix into the flour and your pie crust won’t have the correct consistency to it. Once you have the flour/butter mixture the correct consistency, add the water one Tablespoon at a time and mix well using a fork. 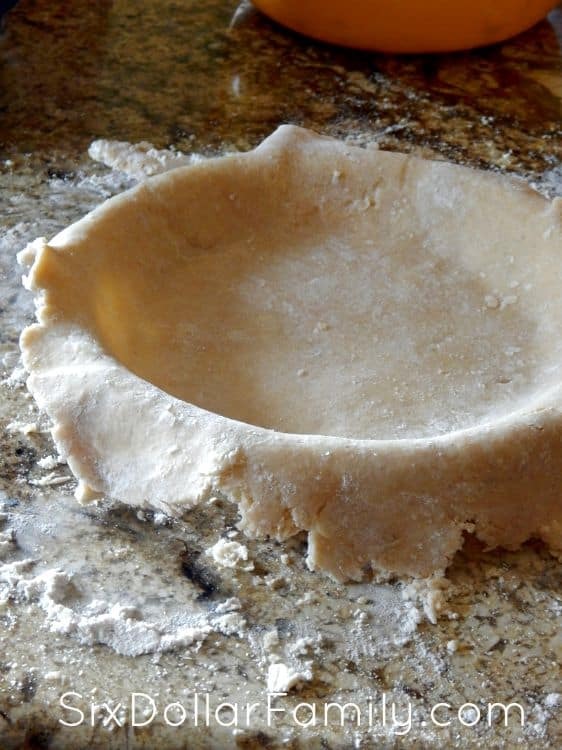 After you’ve added all of the water and have it mixed in well, split the dough ball in half, roll each half out on a well floured surface using your pie plate to measure how big to roll it. One piece of pie dough will be the bottom crust of the apple pie recipe while the other will be the top covering. Whichever piece you’re using for the top crust should be a tad bit larger than the bottom piece to allow room for it to really cover your pie. Seat the bottom crust in the pie plate and trim around the edges if you need. You can also fold any excess dough under if you like an extra thick crust. Fill with your bottom crust with the cinnamon covered apple pie filling making sure that you layer the apples on top of each other to really fill your crust. Don’t worry if the filling comes up higher than the pie plate by a bit. This is why you made the top pie crust larger than the pie. Pour any water that you have left over the apples. 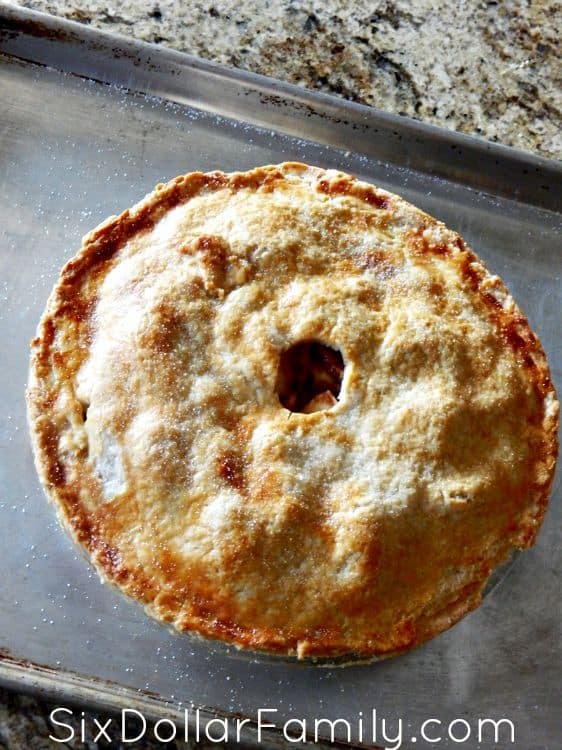 Place the top crust on top of the apples and cut a small circle out in the middle to give your pie a way to vent steam. If you don’t do this, your top crust can crack and break which results in an edible but not very pretty pie. Press the edges of the two crust pieces together to form the seam. Beat the egg and using a pastry brush, wash the top crust with the egg. Sprinkle the remaining sugar on top of the crust. If you would prefer, you can also cut the top pie crust into strips to weave and create a lattice crust. That is by far harder to do so we won’t be covering it in this post. Maybe in another post at a later date though. Cover the edges of the pie with aluminium foil to keep them from burning then bake at 375° F for 20 minutes. After 20 minutes, remove the foil and bake for another 35 minutes. Once your homemade apple pie is finished baking, allow it to sit for 10 minutes or so and serve. It is fantastic warm with a dollop of ice cream or serve cold if you prefer. Traditional Apple Pie recipe with a homemade pie crust recipe - Ready for fall? 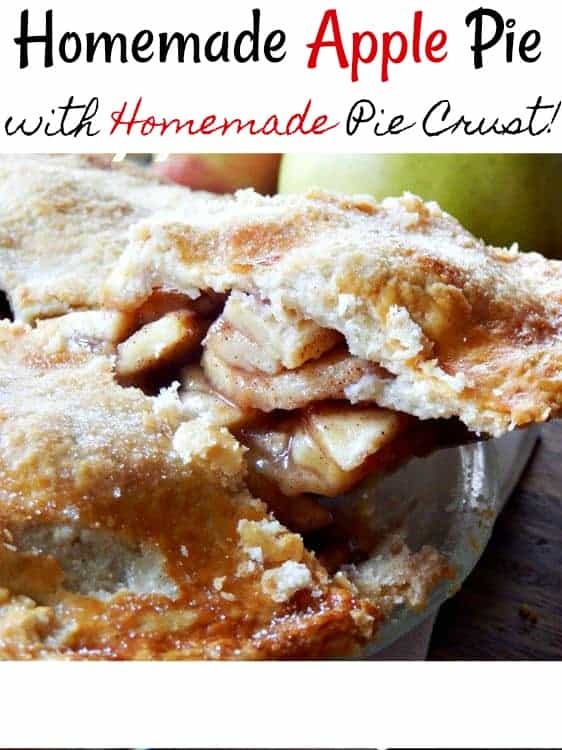 This homemade apple pie recipe and homemade pie crust recipe are just the ticket to cure your summer blues! Warm, sweet and gooey, it's the perfect taste of fall! It's sure to become one of your favorite fall recipes ever! 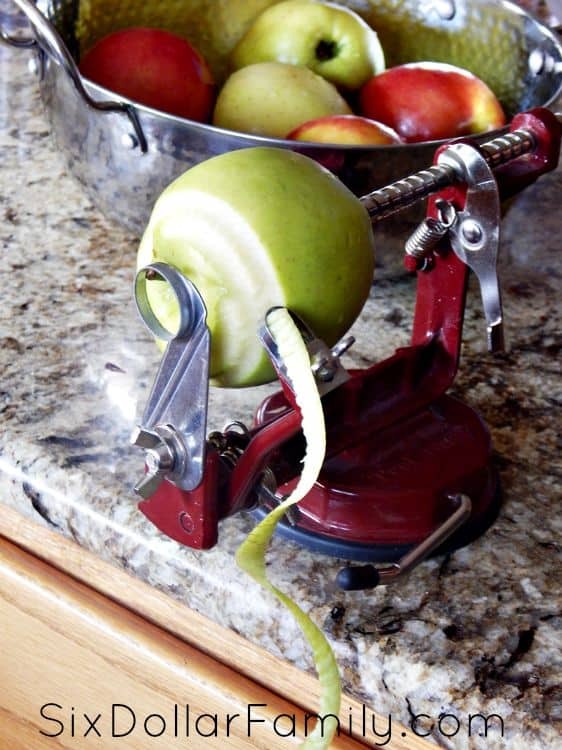 Using an apple peeler, peal the apples and cut slices in half. Toss the Apples in a bowl with sugars, cinnamon, flour, and nutmeg. Once apples are coated with the sugar mixture set them aside. Begin on crust by mixing flour and 2T of sugar. 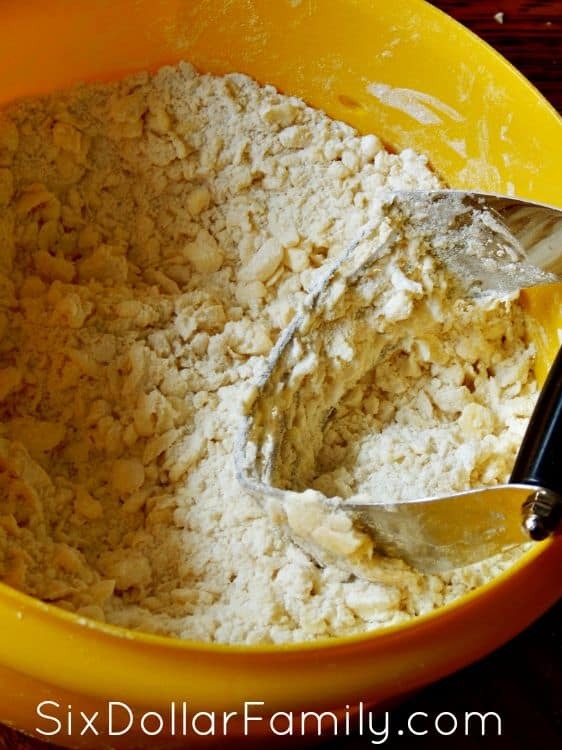 Cut butter into cubes and use a pastry blender to mix the butter into the flour mixture. Use a Fork when mixing the added water (Add 1 T at a time). Once dough is ready split in half and roll each out on a floured surface. Measure the size of the pie plate on the dough to know how big to roll it out. (The top will need to be slightly larger. Add in the sugared apple pieces layering them evenly on top of each other. It’s going to be a little taller than the pie plate. Pour any remaining liquid over the apples. Add the top crust to the pie and cut out a circle in the middle of the crust. Crack one egg and whip it. Brush some on top of the crust and then sprinkle the remaining sugar on the crust. Cover edges of pie and bake for 20 minutes. Remove foil and continue to bake for 35 more minutes. Let sit for 10 minutes then serve warm.